Kodak introduced the 110 format in 1972 and Rollei discontinued the 16s and developed the A110. Made of plastic and metal the quality never matched up to their 16mm camera. 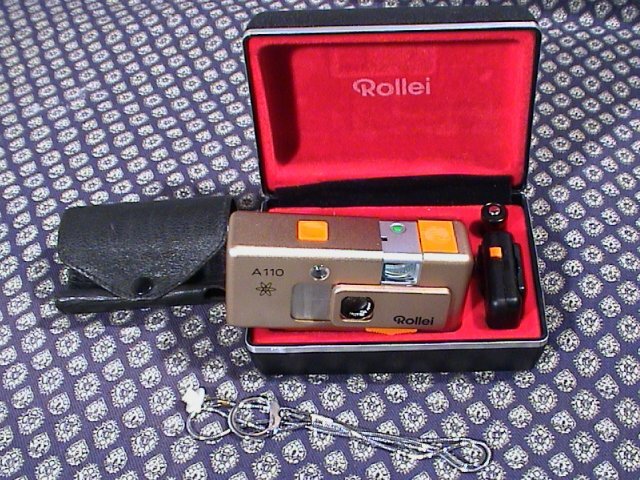 The Rollei A110 was priced initially at 548DEM (300USD) and when they failed to sell well Rollei introduced the Pocketline. Although excellent quality lens the Rollei A110 and E110 lack any easy way to synchronise a standard electronic flash requiring X cubes or for daylight use only. Both A110 and E110 use a PX27 mercury 5.6V battery. The replacement silver cell battery S27PX is 6 volts. This seems to make little difference to the A110 but the E110 holds the shutter open longer with the higher voltage battery; over exposing by several stops. 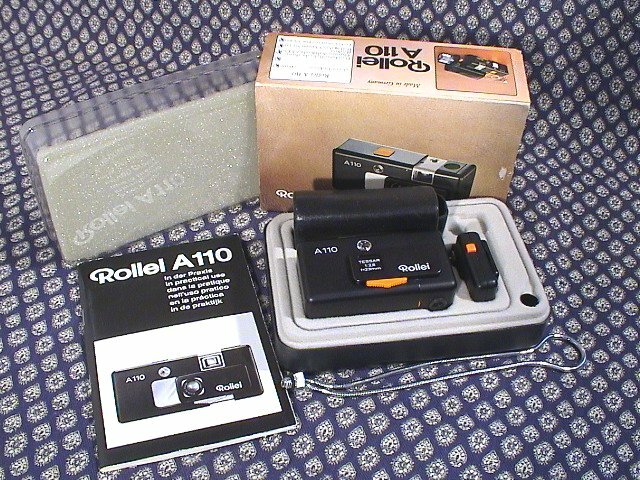 The Rollei A110 was priced initially at 548DEM (300USD), a questionable price for any camera in 1974. It has a pull out external sleeve which acts as cover for the viewfinder and lens and is coupled to the film advance, shutter cocking mechanism and exposure metering. Double and blank exposures are prevented. When closed the battery is switched off. It is one of the smallest 110 cameras being 84 x 44 x 30mm (3 1/4 x 1 3/16 x 1 1/4 inches ) when closed and 100mm (4 ") wide when in use. Weight: 185 g (6 1/4 oz) with PX27 battery and without chain. The A110 has a 1/4" tripod socket and the special flash cube adapter locks to the side for use with electrically fired flash cubes. It has a Carl Zeiss 23mm f2.8-f16 Tessar lens with four elements in three groups. A bright orange slider, under the lens, controls the focus scale. Focusing from 1m (3.5 feet) to infinity with scale in meter, feet and by symbols. Electronically programmed shutter, EV range 0.3-10,000 cd/m2. The Silicone photo-diode meter provides computer exposure control even with flash pictures and daylight fill-in. Continuously controlled exposure programmed from 4 sec f2.8 to 1/400 sec f16. It has a test button with dual indicator for time and normal exposure. The serial number is found on the lens surround but none on the camera body. The results are excellent but the camera has a reputation as being unreliable. Most samples found now are in good condition and working. At least two variations exist. The original production was in Germany. To reduce production costs (i.e. raise profit margins) the camera was made in Singapore as denoted by the embossed lettering in the plastic of the film window. A special 'Atom' edition in gold or titan colouring was also made in Singapore. Some A110 models can be found with an "Atom" symbol on the front and in a gold finish. 5000 of these where sold by Otto Versand (mail order catalogue). The camera is otherwise identical to the A110 Made in Singapore. Limited number of A110 where made with gold plating with an estimated value today of $1500. For the auto maker BITTER Rollei built 160 special edition A110 cameras in 4 different colours (1974-1980). The cameras were put as an accessory into the glove compartment of BITTER Coupe sports cars; each camera matched the exterior finish of the car. 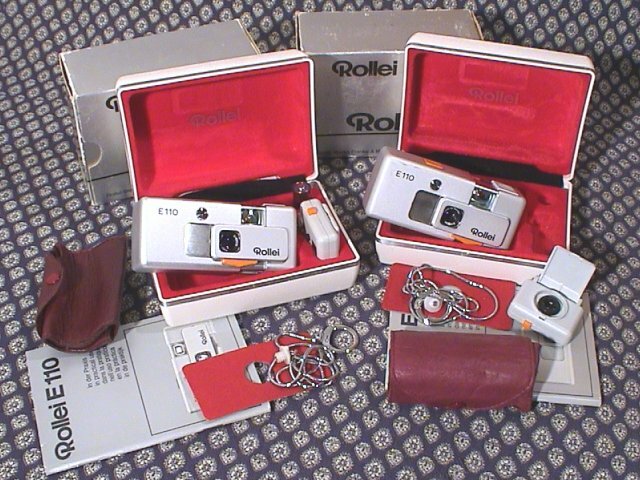 In 1976 Rollei introduced a slightly simpler and less expensive camera the E110. A brushed aluminium finish it has the same focusing Carl Zeiss 23mm f2.8-f16 Tessar lens with four elements in three groups. The CdS controlled electronic shutter with pre-selected ranges at f16, 5.6 or 2.8; flash aperture automation coupled to distance/symbol scale, speed 1/60 sec with 64-100 ASA, 1/250 sec with 320-500 ASA; continuously controlled exposure programme from 4 sec f2.8 to 1/250 sec f16. Automatic feeler for film speed 64 to 100 ASA and 320 to 500ASA. The bright frame viewfinder has indicators for distance, normal/long time exposure, shutter release and battery check. Same dimensions as the A110, 84 x 44 x 30mm (3 1/4 x 1 3/16 x 1 1/4 inches ) when closed and 100mm (4 ") wide when in use. Weight: 185 g (6 1/4 oz) with PX27 battery and without chain. There is at least one variation in the design of the camera. The green button for testing the battery was changed from round to square. Both versions are stamped 'Made in Germany'. A white flash unit is marked 'Made in Singapore' so a version of the camera may also have been. The E110 did not change the reputation and are now often found with meters not working or jammed shutters. More information on the full range of Rollei 110 can be found at the SubClub (http://www.subclub.org/shop/rolle110.htm). For a gallery of photographs taken with the A110 cameras and additional technical specifications visit Classic Cameras produced by Alan M D Macpherson, MSc CChem MRSC Larbert, Scotland.